Home→EMS→UK IT Camps – Enterprise Mobility – Sign up now. ← What every IT Pro wants for Christmas. Life during my first year at Microsoft has been almost exactly as I imagined it might be, but as I always do at Christmas I reflected on the year past and particularly this year on my first 9 months as a Microsoft Employee. Whilst doing so I remembered exactly what prompted me to sign up to this fun ride. Back in 2012 I attended a number of Tech Days which later became re-branded and reworked into IT Camps. The format of these really did excite me enough to take a full day out of my busy self-employed contractor type schedule. A rare thing since a day ‘off’ is actually money lost and often since my engagements were a week long, it was often a week of income lost. So what is so good about an IT Camp that it’s worth the time trouble and sometimes lost income to come and join in the fun? Firstly an IT Camp is a FREE day of detailed technical education with a very heavy hands-on approach. There are IT camps for all sorts of subjects but the one I lead is the Enterprise Mobility Camp. This covers all aspects of Microsoft’s people-centric IT solutions, from advances in the Windows Client operating system to deep-dives into Hybrid Identity solutions using Active Directory in both Azure and on-premises with Windows Server 2012 R2. The unique aspect of our UK IT Camps is that we always allow the participants to build their own agenda. This adds a much greater level of relevance to the audience and requires a much deeper level of preparation by the Technical Evangelists leading the camp. And I am pleased to say it is even more fun to deliver the camp than to present one. The IT Camp content is created by the Technical Evangelists working for Microsoft at our HQ in Redmond (such as @simonster). For the Enterprise mobility camp there are over 500 PowerPoint slides in the material to cater for just about any part of the people-centric story. Call me old-fashioned but I do love the superb PowerPoint application, BUT even I wouldn’t sit through a day of 500 plus slides. No thanks. In a typical day for an IT Camp we may use 20 of those we prefer to use live demonstrations and explanations to get out point across, oh and of course PowerShell too. So what can you expect if you sign up to one of our Enterprise Mobility Camps between now and June 2015. As I already said, we don’t fix an agenda in advance there are only three givens in the day. It starts – you get lunch – it finishes. The bits in between will be filled with a mixture of discussion, presentations, demonstrations and lots and lots of hands-on lab work by you the important person in the room. For this reason it is essential that you bring along a device that can use a browser and connect to the internet (we provide the internet connection) and any lab environments you may need. For those who have been before, if you don’t like working in pairs, then either bring two devices or a large screen (as the manuals are online as well and it can be tiring switching between them all day). 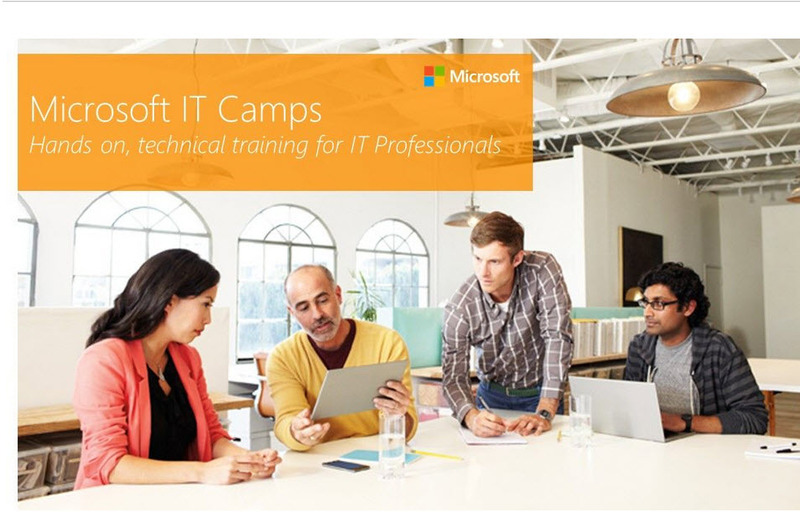 As an example, during the camps this year so far, we have covered Microsoft Intune in cloud and hybrid modes when connected to Microsoft System Center Configuration Manager for Mobile Device Management. We have demonstrated Azure RemoteApp in both Cloud and Hybrid configurations. Both Workplace Join and Work Folders have also figured heavily as has Azure Active Directory Premium. Office 365 integration and Single Sign on / multifactor authentication were also prominent. The identity piece of the puzzle is a critical one to understand so many questions have been posed and answered. The new 2015 Camps have also been updated to include Windows 10 content and most of our demo machines also run Windows 10. We also get to demonstrate most of these through the use of iOS devices, Windows Phones projecting their screens through Miracast and even the odd Android device too. A large number of IT Pros prefer to learn by a mixture of listening watching and hands-on – the UK IT Camp experience provides all of these in abundance. Why not visit http://aka.ms/ukitcamp and register to come along and find out what @Deepfat and I (@edbaker1965) get up to and how you can begin to understand how the people-centric IT vision can be applied within your own work environment? There are other added bonuses too. Since everyone present if focusing on the same topics, you get to meet fellow IT Pros interested in similar areas, who may well turn out to be great future contacts. Finally we also hand out odds and ends as prizes for asking that difficult (or seemingly easy question) that others are just too shy to ask.